This week the team is at the Tour of Tasmania. As always, we are providing our riders with healthy, nutritious food to help them tackle the grueling 5 day stage race. Combine the Chicken and Marinade ingredients in a bowl and set aside for at least 20 minutes but preferably overnight. Remove chicken from marinade, set the marinade aside. Heat ½ tbsp olive oil in a deep skillet over medium high heat. Place the chicken in the skillet, skin side down, and cook until golden brown, then turn and cook the other side until golden brown. Remove the chicken and set aside. Pour off fat and wipe the pan with a scrunched up ball of paper towel then return to the stove. Let the liquid come to a simmer and let it simmer for 30 seconds. Place the chicken on top then place a lid on the skillet. Bake in the oven for 35 minutes. Then remove the lid and bake for a further 10 minutes, or until all the liquid is absorbed and the rice is tender (so 45 minutes in total). Remove from the oven and allow to rest for 5 to 10 minutes before serving, garnished with parsley or oregano and fresh lemon zest. Add the steamed vegetables to the rice just before serving (vege’s simply steamed for ease of cooking in facilities). 1. 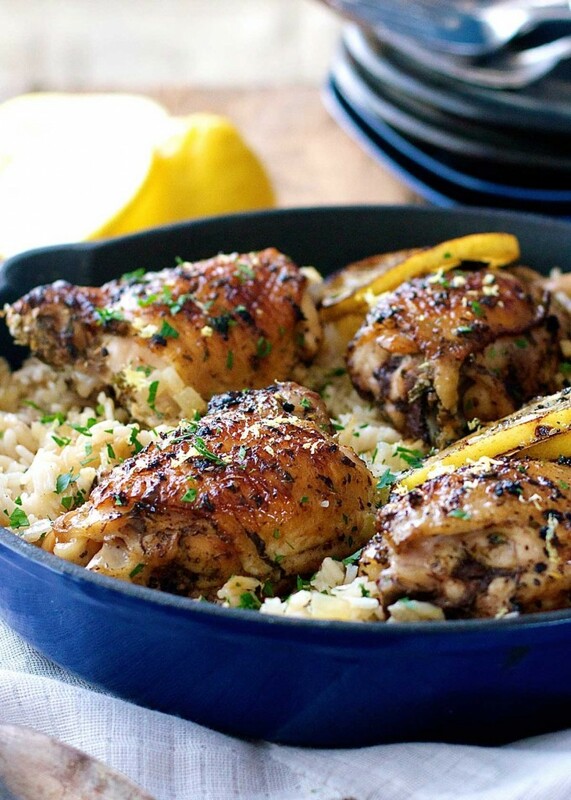 Use whole chicken thighs because there’s more flavor. But you can use skinless, boneless chicken thigh fillets if you prefer. If you do that, place the chicken in the pan 20 minutes into the baking time because the chicken won’t need as long. You can also use breast, but be careful it does not get too dry! 2. Use a skillet at least 30cm in diameter. It’s the perfect size for this. 3. If you don’t have a lid for your pan, use foil, or even a baking tray. 6. This recipe will work with any rice apart from brown basmati rice. Risotto and paella rice are also not recommended. 7. You need enough lemon to get 4 tbsp of lemon juice which will be 1 large or 2 small lemons. Use all the zest from the lemon(s) that you use.